Hello. My name is Ronald Jeffrey Albanese, RJ for short, and I’m the author of The Meaning of Life: It All Hangs on One Decision. I’m always asked what inspired me to write this book, so I’m going to answer that question by giving you a glimpse into my past. Since I was a little boy, I wanted my life to mean something. I didn’t want to be on the last page of the newspaper; I wanted to be the headline! This attitude was good and bad. It was good because I had confidence and drive to succeed; it was bad because I thought I knew what was best for me and everyone else. As a young adult, I became a self-help junkie and the cool captain of my awesome ship. By the time I was 32, I had been on the ground floor of a successful computer software firm and had formed a rock band. The secret ingredient always focused on putting together a super team. It was working because I was literally living the dream. However, in one moment of time, I hit a wall — LITERALLY! Flying down the road in my Porsche, without a care in the world, I didn’t know a cement construction divider had fallen off a truck until it was right in front of me. The next thing I knew, my Porsche was flying through the air. In mid-air, I had a strong impression that this might be it for me! I did not have my seatbelt on, but my failure to buckle up probably saved my life. Somewhere between the second or third roll of my car, I went through the windshield and rolled into a big ditch. Right after I stopped, the car hit the bank on the far side of the ditch and burst into flames. When I came to my senses, I was on my knees at the side of my prized possession, the symbol of my success, watching it burn. Kneeling there, I tried to understand why I had survived. Was I just lucky, or did an angel save me? Just then, I heard a voice yelling, “He’s alive!” The man was running down to me and began to check my physical condition. He was a fireman. I told him what had happened, how I miraculously survived, but his response to my tale was totally unexpected. He put his hand on my shoulder. “That has nothing to do with it.” Then he walked away. I never saw him again, and I never found out who he was; but his words shocked me to my core. At that moment, I realized that nothing I had done — not even making a lot of money and expressing myself artistically — had really satisfied me. All I knew was I had a second chance in life, and it was no longer going to be about me. My life turned on a dime, and my heart’s desire became to help people live better, including myself. I began the journey to find The Meaning of Life. For the next ten years, I checked out everything. I was in and out of every major religion, various cults, and Eastern philosophies, trying to find the answer to life’s greatest questions: Who am I and why am I here? 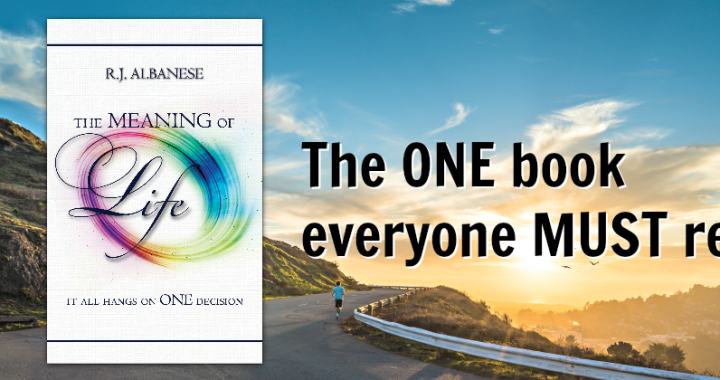 I experienced a second miracle — and the greatest miracle — when I finally found the answer. For the first time, I experienced real, lasting, inner peace. I knew, without a doubt, who I was, my purpose, my value, and where I would spend eternity. It was awesome! The greatest gift of all is to know The Meaning of Life—and I want you to know it too. It won’t take you long to read my book; in fact, in an hour or so you can change your whole life. You will see it all hangs on one decision. After the Bible, I truly believe this is one book everyone on Earth should read. I know you will enjoy it!